OK—So what have I been doing? It was made with a bunch of left over yarns—and there is still a bit of the multi color wool (a single, partial skein I inhereted)-Which no doubt, could be divided and worked into a pattern with the green and white --and I still would have MORE of the green and white bits left over. Plenty enough to work with the mini skeins I dyed last week. One of the skeins(the green/yellow/purple) has explained to me how it wants to be knit up--(a lovely idea) and I have promised it—OK—just as soon as I finish the NORO. As for the pattern for this hat--Pattern? What is this pattern you speak off?? The yarn just got its self together and dicated (in a conspiratcy with my fingers) how it was to be worked. I cast on (the yarn is pretty fine) 120 stitches (a multiple of 12) using size 5 /3.75mm needles. I worked some ribbing, and then increased (can you guess?) 12 times. And then checkerboard, and then some more increasess and the lozenge shape –a 6 stich pattern that just created itself as I knit. Then a final increase (156 stitches) and a picot (K1, K2tog) turning round. Decreases follwed the turning round, and another set of large lozenges--(12 of them.) I thought this was going to be a set of chevrons when I started them—but as I knit, my fingers duely informed me I WAS WRONG—and Yes, the center of those lozenges are filled with 2 colors—plus the white border.. a half dozen rows of 3 colors per row. If you look close, you can see the raised double center decreases at the back half of the lozenge--where there were more decreases. 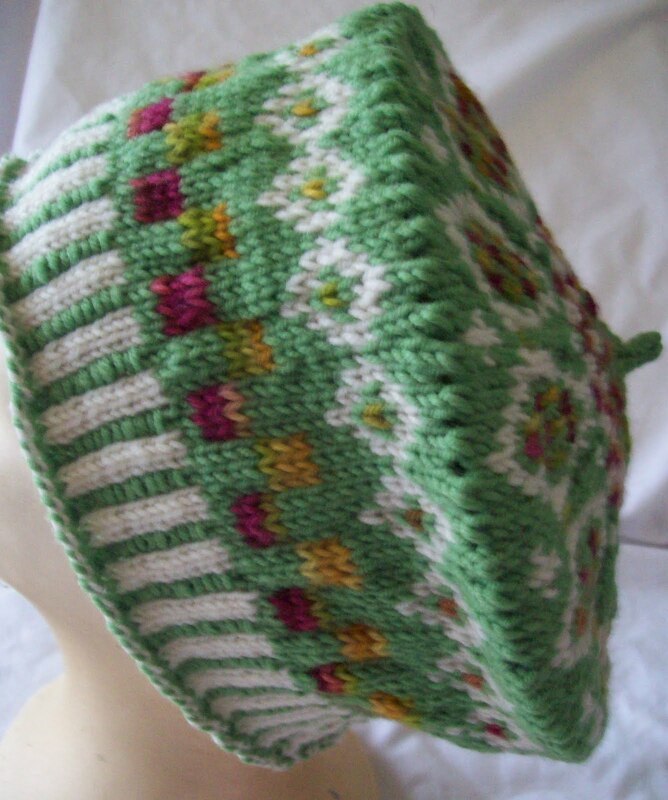 Some more checkboard, and final set of decreases—12 rays of green with the multi color yarn between them. Finally a little I-cord stump. Blocked Saturday (midnight) till Sunday evening—and finished (all the ends woven in) by midnight last night. 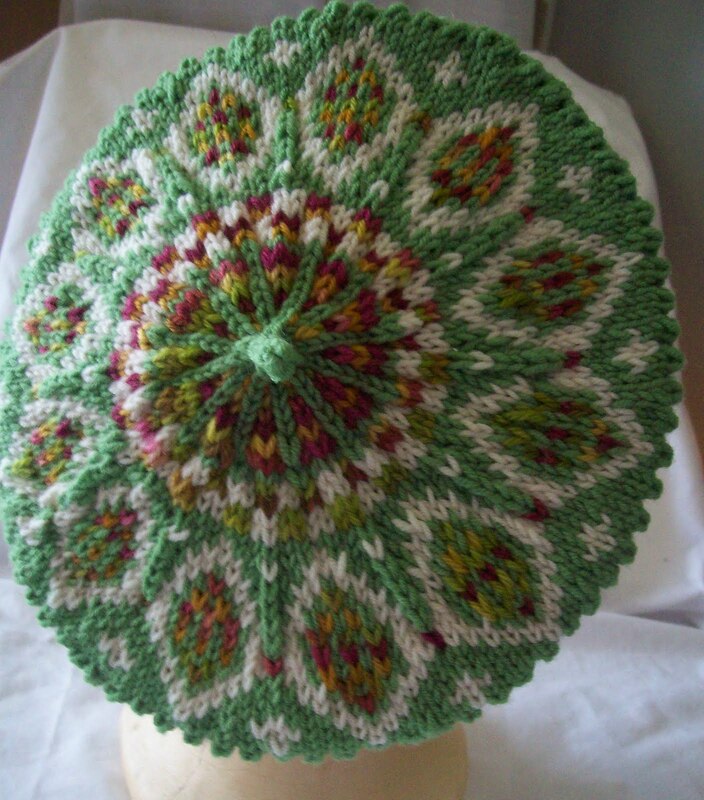 I really like the results... Knitting this hat—with its Oh, . SO regular color changes--(vs the wild color changes of the NORO) was a pleasure. I LIKE (really like) orderly colors and symmetry. What is worse—a whole bunch of other colorful (some of them rather subtly so) are crying out—ME, too, Me, Too—I could be something beautiful too!--I could be symmetrical, I could be orderly, I too could be a hat! No doubt, they could—and eventually—will be. I could have worked on the Noro Vest yesterday at Panera's—that was the plan. But instead I got a treat –(2 actually!) First Rena (aka GlassNeedle) asked me to help her—Her super sized skien of yarn—not Red Heart it was softer—but some acrylic that she was using for the Red Scarf project—had exploded. And she asked me to help. I don't belong to the Untanglers group on Ravelry—but I LOVE (OK maybe just really enjoy) detangling stuff. When I was done—the second treat—lunch! --(same old French onion soup that I get 99% of the time) which still problebly cost more the skein of yarn new. But I understand-- We all get some donations—and hate to waste yarn. Love the hat! I have trouble with too much random, where are my eyes to rest?